From the Marlborough Express – highlighting sensitive marine sites Port Underwood (the Knobbies and Whataroa) as being intolerant of any seabed disturbance. Map of the sensitive areas shown at the end of this article. The heavy steel doors from trawling can damage and destroy extensive areas as they are dragged over the seabed. Eleven ecologically significant marine sites in the Marlborough Sounds cannot take anymore anchoring, trawling and dredging, a panel of marine experts have warned. Without protection or strong management, Marlborough’s significant marine sites will continue to be lost or degraded, some of New Zealand’s foremost marine scientists have told the Marlborough District Council. Council will have to decide if they should ban any activities that cause contact with the seabed on these sites. The panel endorsed the findings of a report by marine biologist Rob Davidson to the council in July that said more than 1431 hectares of seabed ecosystems, the size of Blenheim and its suburbs, had disappeared in the Sounds since the late 1980s. They agreed with Davidson that Ships Cove, Hitaua Bay and inner Port Gore had been severely damaged due to trawling, dredging and sedimentation. The panel review looked at significant seabed sites based on their vulnerability and risks to them. Rangitoto Roadstead, Catherine Cove, Coppermine Bay, Allen Strait, Picnic Bay, Wedge Point, Perano Shoal, Onauku Bay, Bobs Bay, The Knobbies and Whataroa Bay were most intolerant to any physical seabed disturbance, they said. These sites were the best of their kind in Marlborough and supported fragile species such as rhodoliths – colourful red algae that resembled coral; tubeworm mounds, which provided important habitat for blue cod and brittle broyozoans mounds. Council coastal scientist Steve Urlich told council’s environment committee on Thursday it was not just about prohibiting trawling and dredging but protecting habitat against anchor damage. Bryozoans were tiny filter-feeding aquatic invertebrates which typically formed colonies. The skeletons of these invertebrates over time created three dimensional structures on the seabed. They could be thought of as similar to corals in that they provided habitat for other marine invertebrates and small fish to feed and hide in. In turn, larger fish hung around these habitats, Urlich said. They took a long time to grow, so might take decades to recover once damaged, he said. Sixty seabed sites were vulnerable to dredging and seabed-contact trawling but were relatively unaffected by recreational anchoring, the panel said. These sites were mostly soft-bottom, offshore sites in the outer Sounds. Croisilles Harbour which contained primitive fish lancelet and scallop beds could cope with anchoring and disturbance from light weight gear such as recreational dredges. Long Island-Kokomohua marine reserve was the only full-protected marine site in Marlborough. The panel recommended a buffer zone of 200 metres was needed around offshore sites and a 50m to 100m buffer around sites closer to shore. “Initially it is symbolic protection,” Urlich said. Enforcing a buffer would require education, enforcement through harbourmaster patrols or policy frameworks. The regional policy and development committee agreed in August a ban on dredging and trawling at significant sites was necessary but was unlikely to be sufficient to fully protect those sites. The committee endorsed the need for buffer zones and anchor management at fragile sites, however a policy framework had not been implemented. Councillor Jamie Arbuckle said the panel’s recommendations should be included in the new Marlborough Environment Plan due to be released in December. Environment committee chairman Peter Jerram agreed council needed to take action. Regional planning and development chairman Trevor Hook said the information needed to be carefully considered with community consultation before writing policy statements. 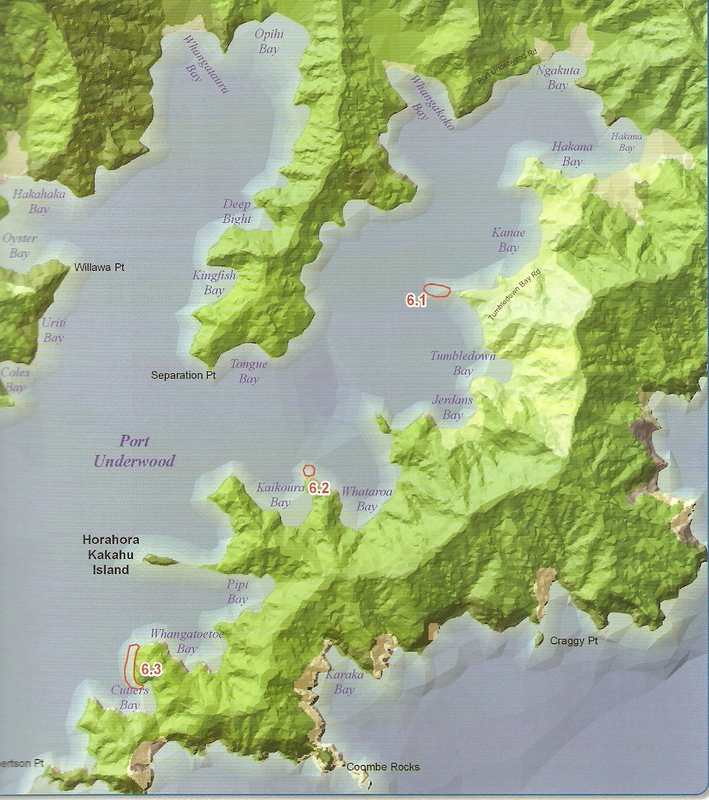 Attached is the map of ecologically significant marine sites in Port Underwood. Sites 6.1 The Knobby’s and 6.2 Whataroa Bay are very susceptible to damage by dredging, trawling, and anchoring.